Need a new water heater for your new or existing home? Let CWLP "buy" it for you! CWLP residential electric customers who install either conventional electric water heaters or hybrid electric water heaters may be eligible for a rebate from CWLP. For the purpose of this rebate program, a conventional electric water heater is defined as having a tank size from 30 to 80 gallons with an electric resistance heating element(s). All units eligible for rebate must meet federal energy efficiency standards. Installing a conventional electric water heater could earn you a rebate of $200. To qualify, the conventional electric water heater must be installed as a replacement for an existing gas water heater or be installed as the sole water heating source in a newly constructed home. For the purpose of this rebate program, a hybrid electric water heater is defined as an electric heat pump hybrid water heater with a tank size from 30 to 80 gallons and with an Energy Factor (EF) of 2.0 or higher. 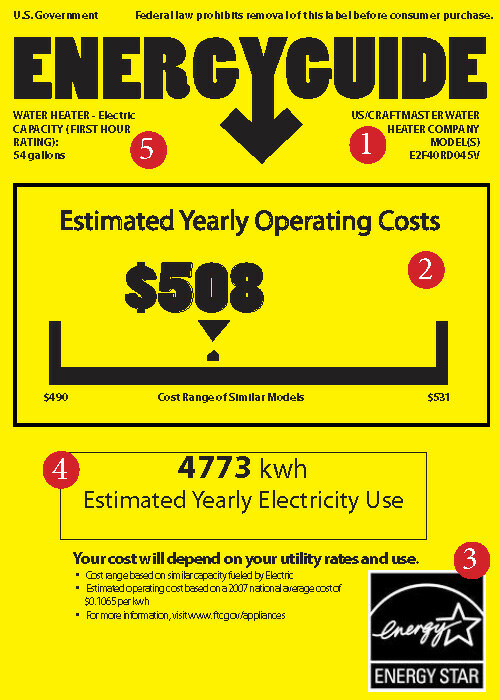 Installing a hybrid electric water heater could earn you a rebate of $400. To qualify, the hybrid electric water heater must be installed as a replacement unit (for an existing gas or electric water heater) or be installed as the sole water heating source in a newly constructed home. Must be within 6 months of the purchase date. Rebates can take up to 60 days to post to your account, as they are processed at the end of each month. Where do your energy dollars go? When thinking about all the energy systems/appliances you use around your home, you might be tempted to think ones like lights, dishwashers, cooking appliances, refrigerators, and heating and cooling systems are the most costly to operate. In fact, though, for many residential customers, water heaters can be—by far—the greatest energy-consuming and most costly of all. 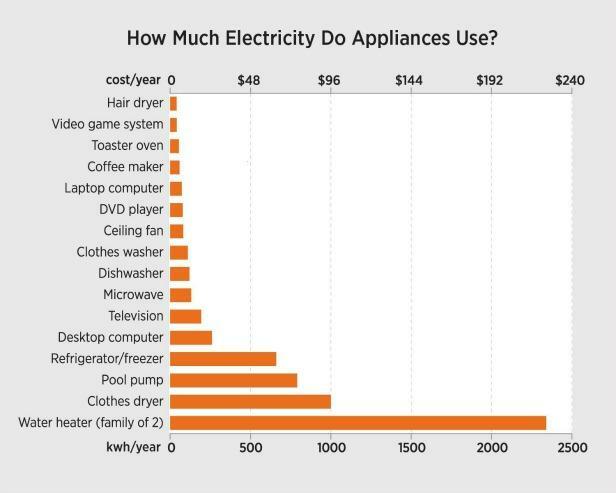 The chart below shows how much energy typical electric appliances use per year and their corresponding costs (based on average national energy prices). Like most appliances, water heaters have improved greatly in recent years. Today's models are much more energy-efficient and will save energy each month compared to units commonly installed several years ago. The CWLP Energy Experts advise you to consider more than just the initial purchase price when you buy a new water heater. Think about how much it will cost to operate over the years. By buying a more energy-efficient unit, you could save hundreds of dollars in the long run. The bright yellow and black Energy Guide Labels manufacturers are required to place on all appliances will help you compare the energy efficiency of various units, so be sure to pay attention to them. Who made the appliance and what is its model number and size? What is the estimated yearly operating cost (based on the national average cost of electricity) and the range of operating costs for similar models? If the ENERGY STAR® logo is displayed, you'll know this model meets strict criteria for energy efficiency. What is this unit's estimated yearly electricity consumption? What are the key features of this appliance and the similar models that make up the cost comparison range?